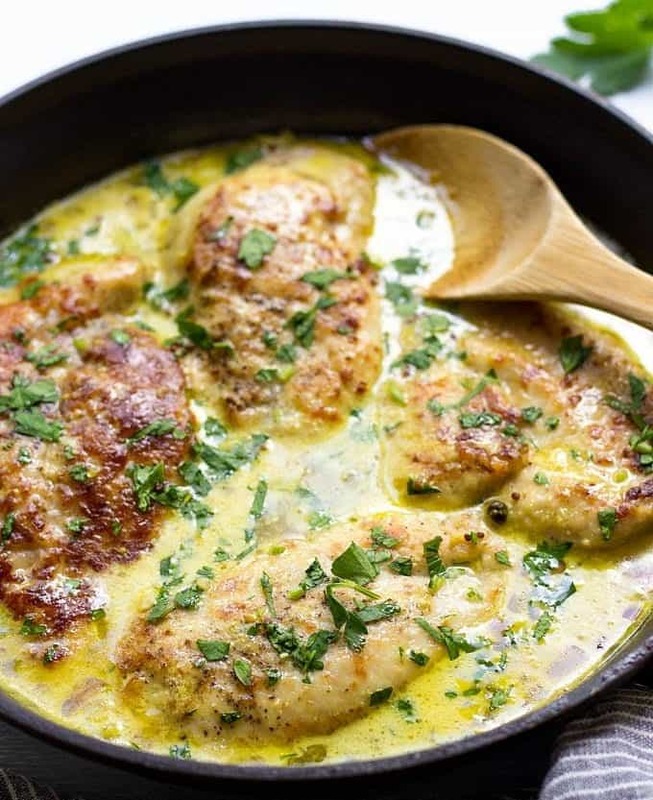 Chicken with Creamy Parmesan Mustard Sauce is an incredibly easy one skillet dish, that is full of comforting flavors and ready in just 30 minutes. Delicious weeknight meal made simple! You know what’s interesting these days? Based on several major food blogger’s statistics, chicken and pasta recipes receive the most popularity on Facebook and other social media platforms. While I always try to come up with recipes that might not necessarily be trendy, they are sure mouthwatering. 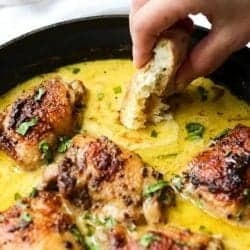 But since chicken is indeed most often bought and loved by most people type of meat, I decided to put together a chicken recipe that you’ll absolutely love. And I’m pretty confident in that. You know why? 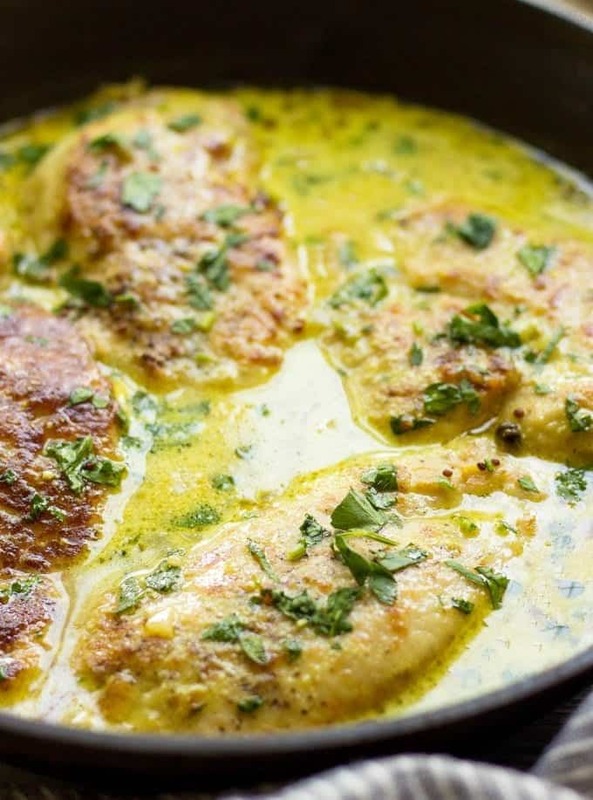 Because it’s based on my popular French Mustard Chicken Recipe, which people are crazy about for a reason. It’s easy to prepare, super juicy, packed with flavors and so French. Unlike my previous recipe, I wanted to simplify the process as much as possible and make it more suitable for a quick weeknight meal. My French Mustard Chicken requires a little bit of braising in the oven. For this recipe all you need is one good skillet, stove top and less than 30 minutes of cooking time. And in the end you’ll have the recipe that is twice as faster to make with flavors and taste preserved. First important ingredient that you need to have on hands is Crème Fraîche. It is very popular in French cuisine. Crème Fraîche is what gives our recipe creaminess and reacher flavor that a regular cream. You will also need good Dijon Mustard and Whole Grain Mustard. These 2 go side by side in cooking and contribute to a little tang and depth of color. 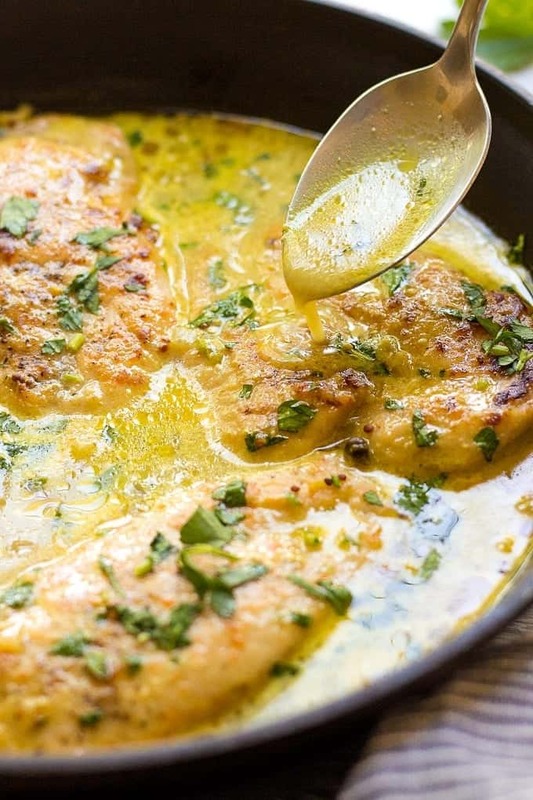 The sauce in this Chicken recipe comes out super silky, rich and out of this world delicious. If you’re making a side dish to go along with chicken, make sure to drizzle that sauce all over your rice or pasta or whatever else you made. It’s going to be yummy! After you butterfly chicken, you'll have 4 cutlets. Sprinkle both sides of the cutlets with salt and pepper. In a small bowl combine flour and 2 tablespoons of Parmesan cheese. Dredge chicken cutlets in flour and cheese mixture. Heat 2 tablespoons of butter in a large skillet and over medium heat. Add chicken and cook for 3-4 minutes on each side until juices run clear. Transfer chicken on to a plate. In the same skillet heat the remaining 1 tablespoon of butter. Add shallot and cook for 3 minutes. Add garlic and cook for 1 more minute. Pour in chicken broth, add Crème Fraîche, Dijon mustard, whole grain mustard and capers. Stir well. Add ½ teaspoon salt and ¼ teaspoon of pepper. When the sauce starts to boil, add ⅓ cup of Parmesan cheese and stir well. *Optional: If you want the sauce to have more intense yellow color, add a pinch of turmeric. Return chicken back into the skillet, cover with a lid and simmer for additional 5 minute. *For dredging you can use grated or shredded Parmesan. I've used both and grated cheese sticks to the chicken a little bit better. Rather easy to make and rather delicious! This is now one of my wife’s favorite meals. Learn to do this one and you can come up with several variations on your own. If you can’t find Crème Fraîche, sour cream works. I find it’s easier if you assemble all the ingredients prior to cooking. Thanks for the recipe. You’re welcome Mike! I’m very glad you liked my recipe! Thanks for this fabulous recipe. I made it for the first time tonight after finding capers in the supermarket. ( I’m an Aussie in Morocco) first time in 5 years I found them so I emptied the shelf. I am adding this recipe to my repertoire. It was a big hit. everyone loved it! Pics on Instagram. I cant wait to look try more of your fabulous recipes. Thanks for your comment! I’m so glad you liked the recipe! Great that you were able to find capers, I’m literally obsessed with them and use them very often in cooking.